I am officially Mrs. Manno!!!! I don’t even know where to start so I will start by saying that I have never been happier. Being Kevin’s wife is such a gift and an honor. Some of you may have seen some of our wedding photos in Us Weekly recently. I have to mention Us Weekly quickly because they have been so incredible to us. Really. I know some people don’t give a lot of credit to weekly mags, but over the years we have developed such a great relationship with Us Weekly and the people there (thank you Peter and Brody!) and that’s why we decided to share our wedding photos with them! The issue with some exclusive pictures might still be on stands if you wanna run out now and grab a copy! 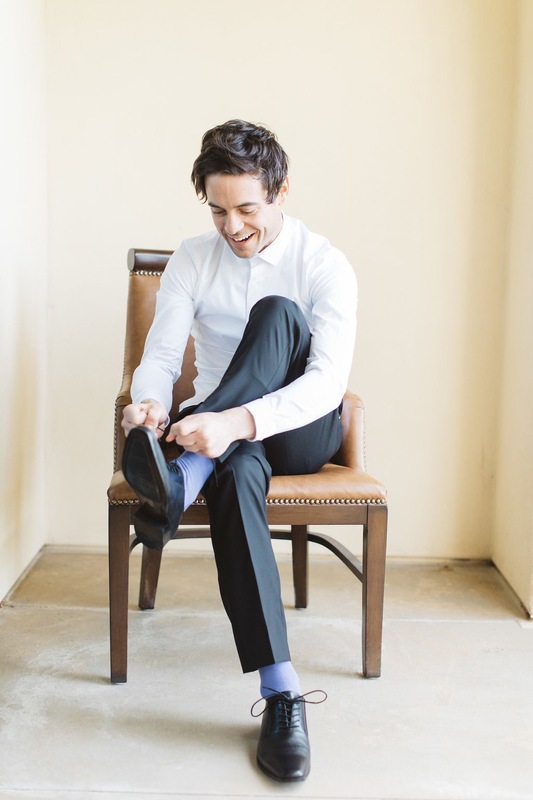 Ok… let’s talk about this wedding! This perfect PERFECT day! We were SO nervous in the few weeks before the wedding because Los Angeles was getting record high amounts of rain. It felt like it rained for almost 2 months straight with a few sunny days sprinkled in. Luckily for us, our wedding day was just gorgeous! 70 and sunny! 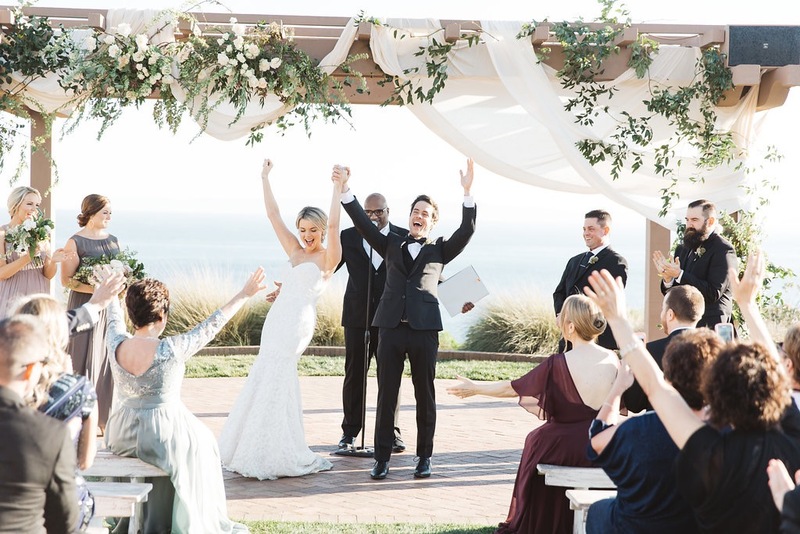 We got married at Terranea Resort in Rancho Palo Verdes. Is this place not stunning?!?! As many of you know, we originally had our hearts set on Mexico as a destination wedding, but then Zika got really serious and we didn’t feel comfortable asking our friends and family to travel there. So we then started our search for the perfect state side destination! And Terranea was it!!! It totally felt like we had a mini destination wedding. The resort is just gorgeous and the views cannot be beat! Plus we were so grateful that all our family and friends stayed at the resort with us. That was important because we wanted the wedding to be a 3-day celebration! Not just the day of the wedding. It was the prefect location. The landscape of Terranea is stunning, so stunning that I didn’t think it could be more beautiful. That’s until Kellye Kodak Clifford of Precious & Blooming flowers stepped in and took our ceremony site to a whole other level! 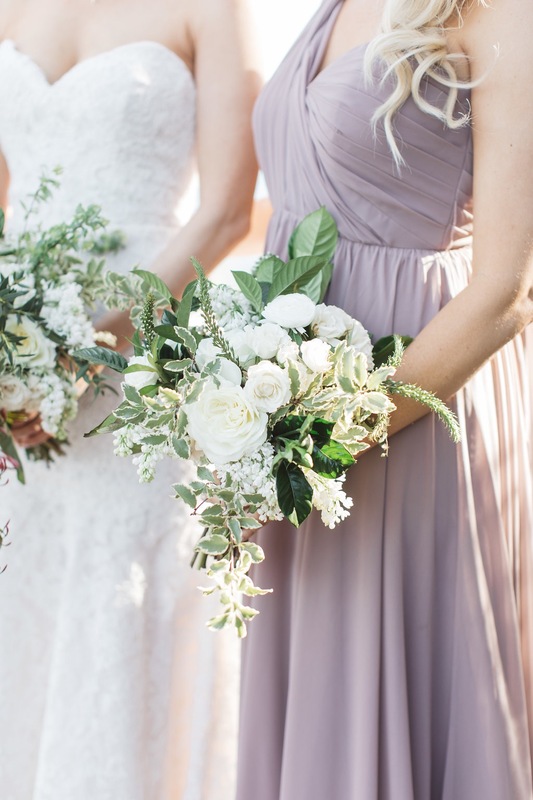 She did all the flowers for the wedding and wow – just wow! 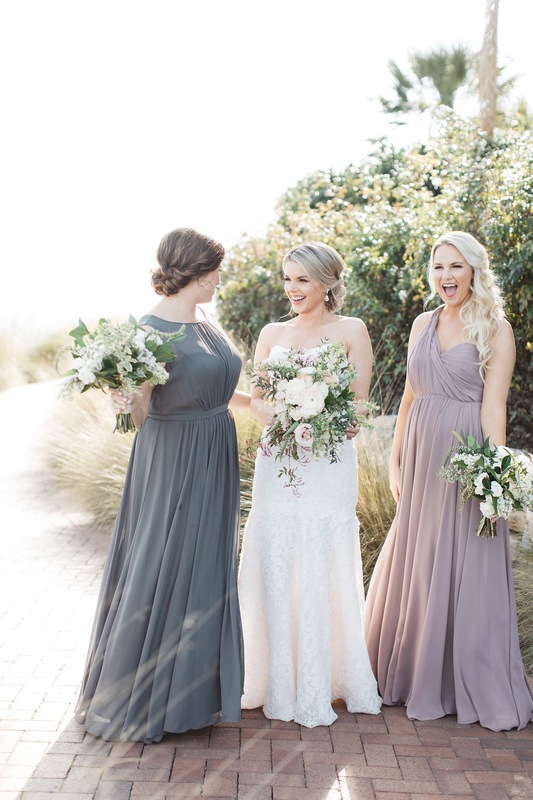 When we first met with Kellye, we told her that we thought we wanted blushes and creams as our wedding colors. But as we began to discuss the flowers more and as she showed us photos, we realized that we wanted a more sophisticated style. We are so grateful she took the time to go over every little detail with us so that the flower colors were just perfect! And I cannot say anything more about the wedding until I thank Natasha and Laura from Gather Events. These two women are superstars!!! We absolutely would not have been able to do this without them! Wedding planning and wedding stress are NO JOKE! I had no idea how much went into planning a wedding. Laura and Natasha handled every little detail and all the logistics of the wedding, which gave us more time to handle personal aspects of the wedding like my dress, family stuff, our vows, etc. What I loved most about working with them is even when I was sure things were stressful on their end (especially the week before the wedding when things were changing LAST minute!) they never let on that they were stressed. I cannot even begin to explain how much that meant to us. Every time we talk to them they were thorough, prepared, and calming. And everything went so smoothly and perfectly on the big day with them coordinating everything from start to finish. If you need wedding planners, I could not recommend them more highly! You girls are the best!!! Speaking of planning, four weeks before the wedding I decided I wanted a second dress! Ha! Anyone who has gotten married knows how crazy this is. I mean, I absolutely ADORE my ceremony dress by Alvina Valenta that I got at JLM Couture Bridal. The moment I walked into JLM I knew it was the place I was going to find my wedding dress. I had been to two other dress appointments prior to that and honestly felt disheartened. I remember saying to my best friend Stef, “maybe I just don’t like wedding dresses” since nothing I tried on was good enough in my mind. That is until I went to JLM Couture. I was obsessed with EVERY dress I tried on. I love them. My earrings and hair piece are by Maria Elena Headpieces. She custom made me my hair piece! And Molly’s flower headband is so beautiful! The woman who made it has a shop on esty. She’s saving the money she makes from the headbands to adopt a baby of her own! Please support her shop! So even though I found my dream dress, I decided I wanted a second because I wanted have more freedom to move and dance at the reception and my ceremony dress was very fitted and wouldn’t allow me to “break it down.” Ha! So that’s when I reached out to Val Stefani! I was able to meet with her and her business partner and they were just the sweetest!!! They rush made me this custom gown and I couldn’t be more appreciative for what they did so last minute! I wanted the dress to be fun yet simple and they delivered! Two weeks before my wedding, I was in Mon Amie bridal salon getting it altered and fitted to my body. Thank you Mon Amie for helping make the second dress a reality!!! My bridesmaids wore dresses by Jenny Yoo. I just loved how they turned out! I knew I wanted them to both wear different dresses that were different colors but I really didn’t know how it would all turn out. I thought they couldn’t have looked more beautiful! And I couldn’t have been more proud to have them by my side as I married the love of my life! Raya is my sister and has been there with me since the beginning. And Stef is my absolute best friend. I love her like she’s my sister. I would do anything for her. And when I was getting ready with my bridesmaids, mother, mother-in-law and future sister-in-law we all wore robes from Pretty Plum Sugar! So pretty! How cute is little Molly being pulled in this wagon by my 4 year old niece Lennon? When I was waiting to walk down the aisle, holding onto my father’s arm, I saw Molly and Lennon start to go down the aisle and I just lost it. It was a proud mom moment for me. We were going to put her in this little white dress for the ceremony but last minute I changed my mind and just thought she looked so darling in her little white kickee pants onesie with this flower headband. Plus I wanted Molly to be as comfortable as possible in the wagon since I knew Lennon was nervous about pulling it. But Lennon did such a fantastic job! I am so proud of her. Lennon’s dress is Jenny Yoo, BTW! And a huge thank you to my dear friend Lisa (who hates being the center of attention) who jumped into save the day by helping walk Lennon and Molly down the isle! I bring up that she hates being the center of attention to point out how selfless she was in being so willing to do this for us. She never hesitated when we asked! That is a true friend! Owen was a part of he ceremony too! Kevin’s mom and dad walked Owen down the aisle 🙂 We couldn’t get married without having him there. He’s our first baby! And his little “Best Dog” bandana is so precious! 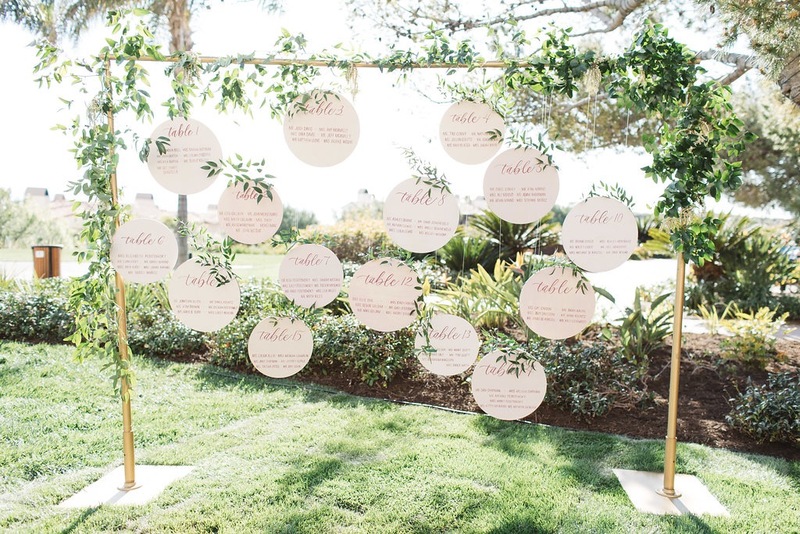 When our wedding planners told me about these beautiful wooden seating charts with calligraphy by Red Letter Day, I had no idea they would turn out so incredible. This display was like 6 feet tall! 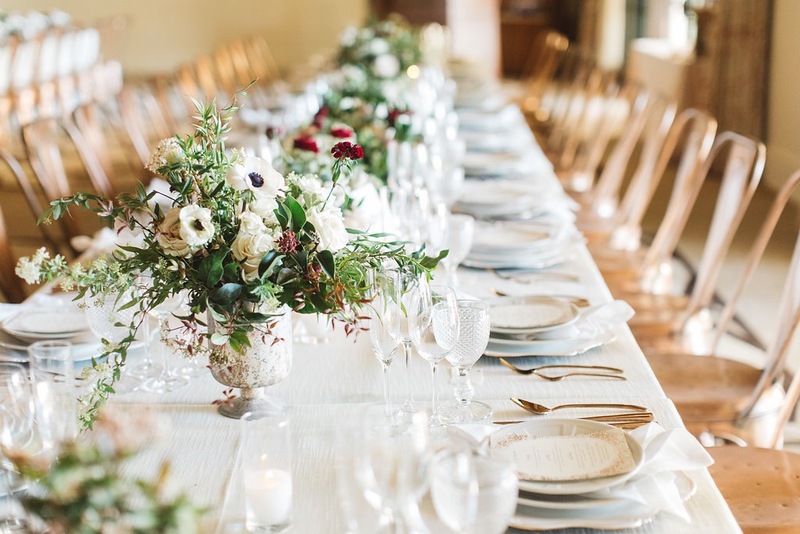 The table settings were simple, elegant, and beautiful! We got the chargers, rose gold silverware (to die for!) 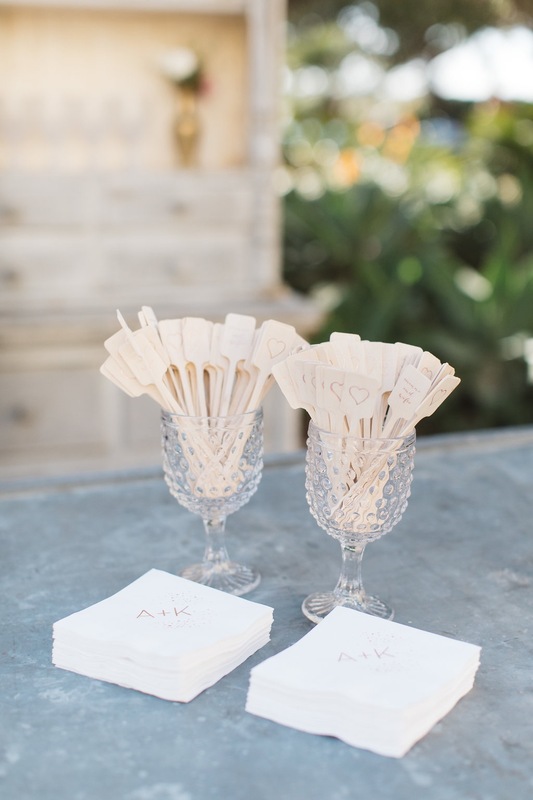 and water goblets from Soiree 8, the classic linens are by Modmix, the menus matched our invitations – we got both on Minted! 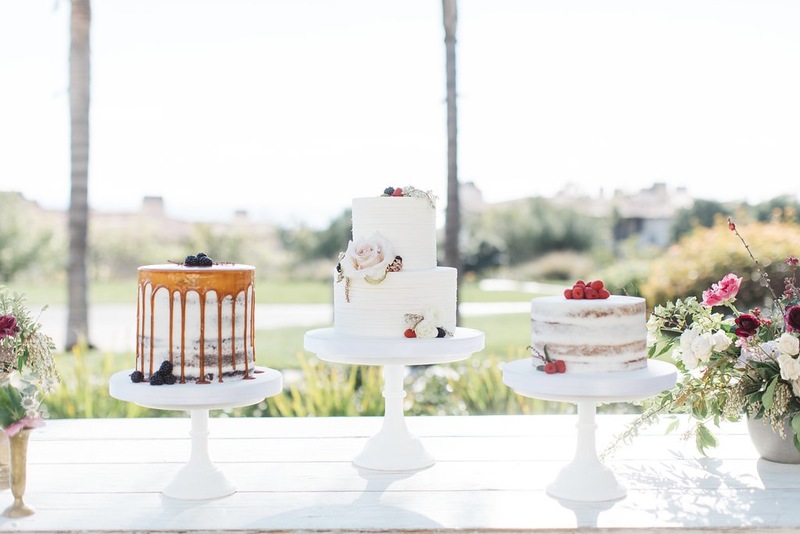 When Kevin and I went cake tasting at Beverly’s Bakery we couldn’t decide on just one cake – so we got three! How perfect is her work? She also did the cake for my baby shower – the most beautiful naked cake I’ve ever seen! 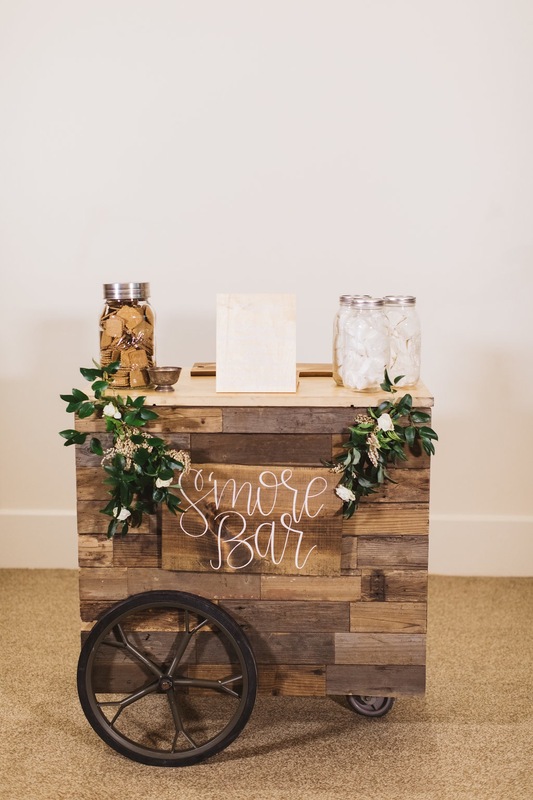 We also wanted something unique for another dessert option at the wedding so we got a s’mores cart! 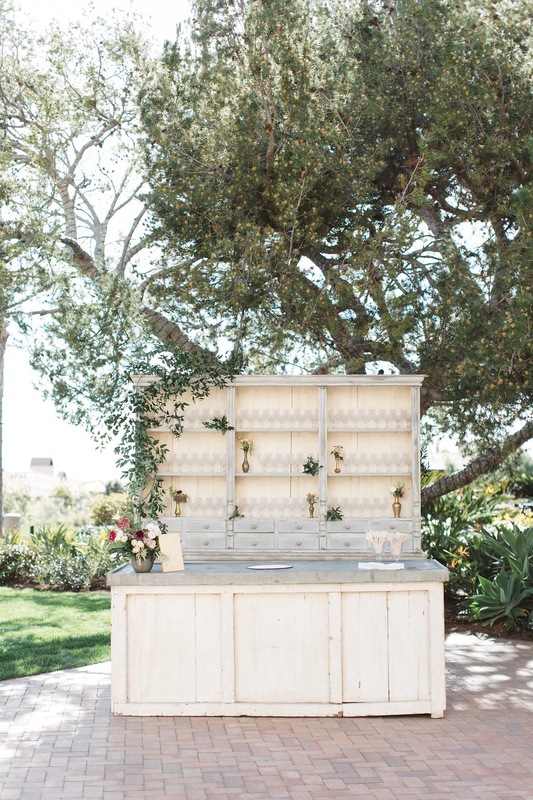 I actually saw this cart by Mallow Mallow at an event and thought they were SO yummy so we got it for our wedding! Although I will say that I am super bummed that I never got to have one at the wedding! Ha! I was so busy dancing the night away that I never ate one. People keep asking me what my favorite part of the day was. Obviously this is an impossible question! Everything was so perfect, but one thing that stood out to me as one of the absolute BEST parts of the wedding (besides marrying Kevin of course) was the band!!!! I’m not even kidding. The Golden Coast Allstars were just that – ALLSTARS! To be honest, I was hesitant about a band at first. I was so used to the original versions of all our favorite songs that I was worried that a band wouldn’t play them quite right. But the Golden Coast Allstars couldn’t have proved me more wrong! They were BETTER than the originals! All of our guests kept coming up to us on the dance floor and yelling “This band is incredible!! !” I felt like I was at a concert! I couldn’t recommend these guys more. Thank you a million times over to the owner Danny who spent a ton of time with us going over the playlist and making sure our ceremony music was just perfect! 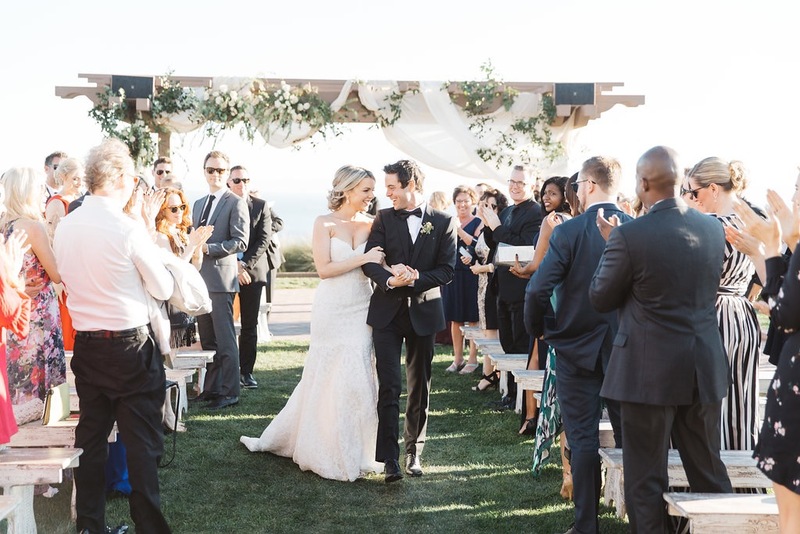 This band also did instrumental versions of Sweet Disposition, Ho Hey (as I walked down the aisle) and Geronimo (recessional) – all of which were perfect! Thank you Danny! You guys are the absolute best!!! Are you guys loving all these photos as much as I am? Ok maybe I am loving them a little bit more since they are of my wedding day. Ha! But they are stunning right? That is thanks to Brandon Kidd Photography. Brandon and his wife Kristin are such a great team and documented all these amazing moments for us. Not only are they talented but they are just overall good people. Brandon goes above and beyond in his role as a Photographer. Multiple times leading up to the wedding and the morning of the wedding when I was feeling stressed (the morning of I was worried that I was taking too long to get ready because I had to keep stopping to care for Molly), Brandon totally put me at ease. Before the wedding day, he emailed us a couple times to assure us that everything was under control and he was going to do everything in his power to help us enjoy every minute of our day. He is a gem! He and his wife both are! Check out all their gorgeous work HERE. Juicebox Media also helped document the day too!!! They made us the most incredible video that I will be posting soon in it’s own blog post!!!! I keep saying that I wish I could bottle up the feeling I had on my wedding day and experience it forever and I feel like Juicebox Media did that for us with the beautiful video they made us. So make sure to come back to my blog later this week for that! And I can’t forget the super fun photobooth with lighting that’s better than any snapchat filter! Ha! No really. It’s AMAZING! I will be having Project Photobooth at ALL my future events! Stayed tuned for another post with A TON of the photobooth pics! I can’t fit them all here or this blog post would be 100 pages long! And I have to give a shout out to my glam team!!!! Emma Willis of Contour Fossa has done my makeup for a little while now and I just adore her! She is crazy talented!!!! Briana Cisneros not only colors my hair (she’s a color master!!!) but she also gave me this gorgeous up-do! 1011 makeup did all the hair for my bridesmaids, mother, mother-in-law and my niece Lennon! Her little up-do was just too cute! And last but certainly not least I have to thank Leila Lewis and Alex Meyers from Be Inspired. Leila has been such a huge part of our lives throughout this entire wedding process. And she even swooped in and planned my magical baby shower right in the middle of all the wedding planning! Leila and Be Inspired, not only connected me to my wedding planners and vendors, but she helped us find our venue from the get go! She also attended the wedding as a guest because she has become such a huge part of our lives! We couldn’t imagine not sharing our big day with her. Leila, thank you. Thank you for answering countless emails at all hours of the day/night – some emails from a very stressed out bride-to-be (sorry about those btw – he he). Thank you for making our wedding day everything we could have wanted! You are the BEST! And we are forever grateful. Love you Leila! To you Molly – not my daughter my other Molly 😉 Thank you. For EVERYTHING! Now that I’ve given you all of the details, I want to try to put into words the emotion of the day. Although, I really feel like it’s impossible to explain the feelings surrounding our wedding day. I can say this, during our ceremony there wasn’t a dry eye to be seen! I think every single person came up to us after the ceremony and told us they cried. This is one of the few instances in life where you feel good about bringing 100 people to tears! Ha! Also in tears, Kevin and I. Neither of us could hold it together as we read our vows. We didn’t share our vows with each other before the ceremony. All we knew is that we were both going to end with the same line “I promise to never forget this moment.” And I promise I won’t forget. The day wasn’t just emotional, it was SO FUN!!! In fact, I was enjoying myself so much that I forget to wear my veil!!! And I forgot to wear the small bow that went with my second dress. Oops! Oh well! 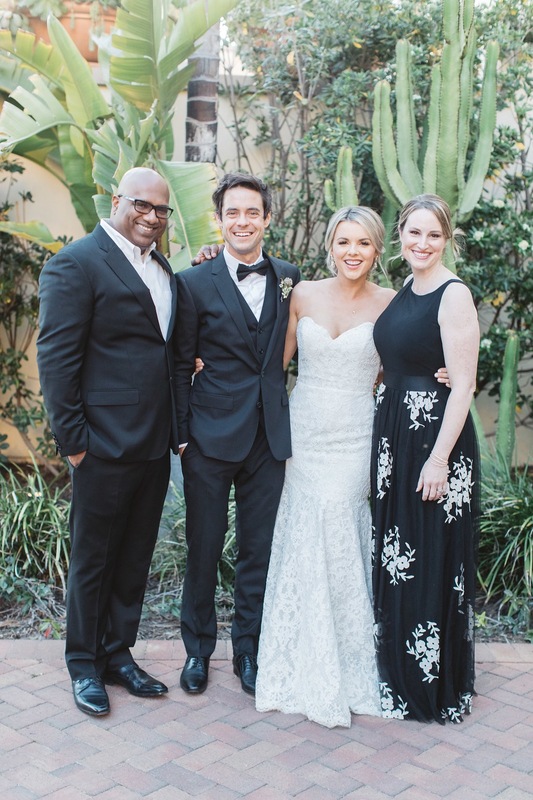 Under the “emotion” section of this post, I have to talk about our officiant and dear friend Mith Niles. Mith has been a part of my life for 10 years now. He has seen me through good times and very dark times and has been by my side through some very tough breakups on my journey to find love. When Mith met Kevin – he knew I had found my partner in life. Mith and Lisa (his wife and my other dear friend!) are family to us. We love them unconditionally and we know they love us unconditionally right back. When we asked Mith to be our officiant we were so nervous because we didn’t want him to feel pressure to take on such an enormous responsibility. Being the amazing person that he is, he accepted our request with a heart full of love. And on our wedding day, he gave us the most beautiful ceremony we could have ever imagined. Thank you Mith! We are eternally grateful. I’ll leave you all with a few more photos to enjoy! Love you all! Thanks for supporting us and our marriage! Ali, everything looks like it was perfect. You , Kevin and Molly are an amazing family. Thank you for sharing your wedding details with the public. May your love and respect for each other grow stronger everyday. Congratulations! Love the wedding beautiful pictures breath of fresh air! Random question but what color was your nail polish? I’m obsessed! Thanks! Absolutely beautiful!!! I am so happy for you both! !The last picture of Kevin looking at you was my favorite!!! !Love you guys!!!??❤️?❤️?❤️???? Ali!!! I have been waiting for this blog post!! The pictures are stunning!! I’m so glad you got your happily ever after!! You are a beautiful bride!! Congratulations!!!! Thank you! Sorry it took so long for me to post! Such a beautifully stunning wedding. I am so happy for you guys! 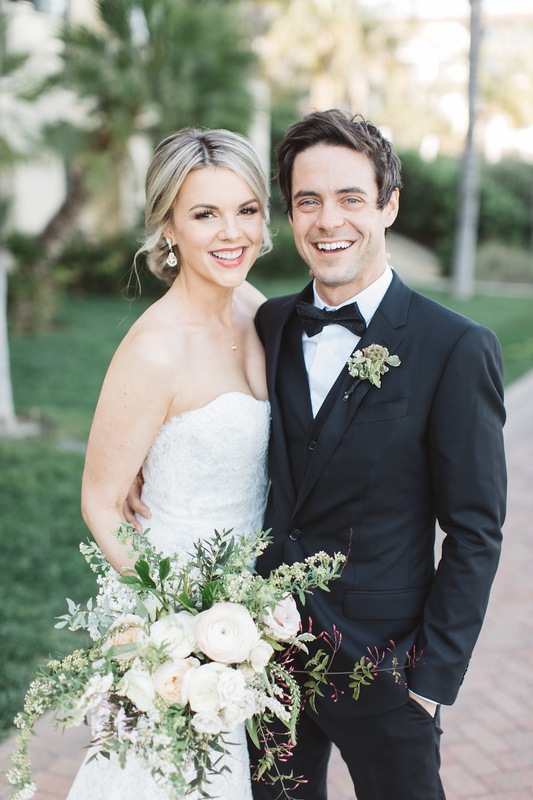 I remember watching you on the bachelorette and to this day, you are still one of my favorites and I am so happy that you found the love that you deserve. Your wedding looked absolutely perfect! Congratulations. So sweet of you to say! Thank you for following my love story from the very beginning! So So So Beautiful!! What a Beautiful Love story!!! Thank you so much for sharing your beautiful wedding photos. I am a huge fan of yours and have been ever since the bachelorette days. You are so nice and so beautiful and down to earth I am also a huge fan of 104.3 radio listening to Kevin in the morning and sometimes on the weekends. You two are a perfect couple with a very beautiful daughter. So so beautiful!!!! Congratulations to your family. BEAUTY FULL. So happy for you. You look so incredibly happy. Love the last picture. P.S. You are one super mommy and I can’t express enough how happy I am for you, Kevin, Molly, and Owen! Ali- you’re wedding looked so beautiful! Random question for you…. what did you wear under your robe? Did you have to wear something underneath? I’m thinking of ordering one for my May wedding! Beautiful, so happy for you. So excited for you all! What a sweet little family & I am so glad you have all of this happiness ? Thank you for the blog post! It is incredible! So beautiful Ali… I sobbed when you spoke about your love for Kevin… it makes me so so happy! I also cried when you mentioned Mith and Lisa because I was just telling friends how much I consider them part of our family! Everything was beyond wonderful and I will always look back at that day as one of my happiest memories…: I love you both always ? SO beautiful… thanks for sharing with all of us. You looked beautiful and so very happy! Love following you on Instagram and FB.. thanks for your fashion ideas. Wishing you a lifetime of happiness!!!! 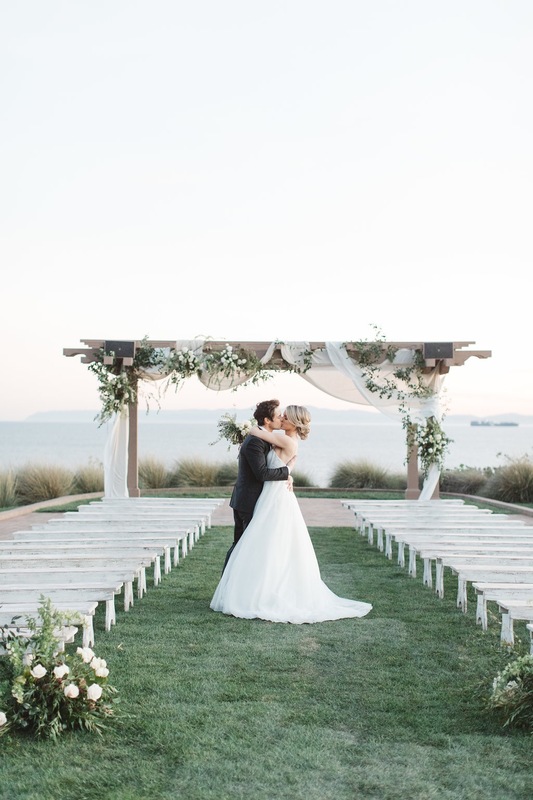 My brother got married at Terranea Resort last year and it is a beautiful setting! Your wedding was beautiful! I am so happy for both of you and best wishes to the future! I have never commented before but I just had to. I am so happy for you and Kevin and Molly and Owen…your perfect little family. I can see and feel the love you two share. Here is to a lifetime of happiness!!! 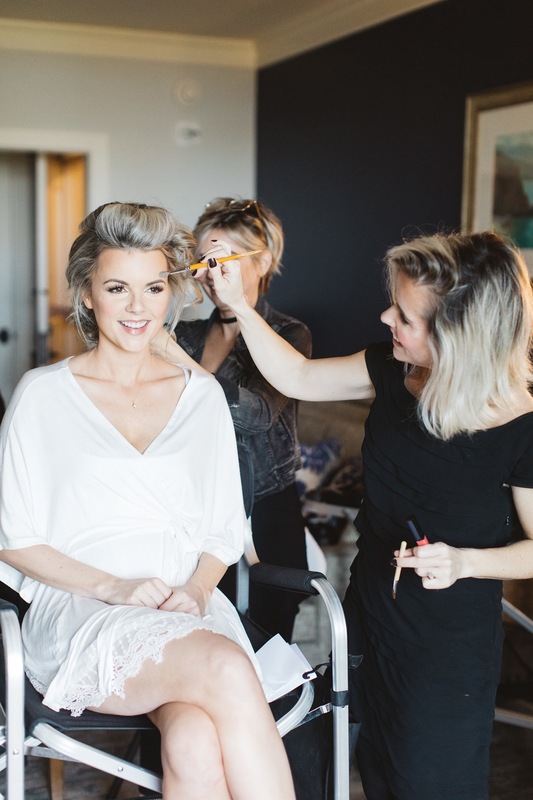 Ali – you are stunning & I love everything about your perfect day! Thank you for sharing it with us! Nice. Using your sacred special day as one big commercial just to cash in. Tacky. Why are you following Ali if you only have something nasty to say? You should spend your time and energy doing something more positive instead of being a judgemental troll. Do you really have nothing else better to do than be rude? How on earth could anyone find something negative to say about his beautiful post?!? Unbelievable. Congratulations to you, Kevin & sweet little Molly. Looks like a beautiful wedding. Thanks for sharing all the great pictures. Oh my gosh, of course I’m crying. SO SWEET! Ali you looked absolutely beautiful. I’ve been reading your blog for a while now and it’s just so special to see you and your new family in such a wonderful place – so thrilled for you! Beautiful wedding! Beautiful family! God bless!? I loved reading this post and seeing all your gorgeous photos. You were a stunning bride. So happy for you guys. I love your Instagram stories with Molly and Kevin’s interviews with her microphone are my very fav. Just a precious family! Wishing you many blessings ahead! Gosh I love all of this so much. What beauty! I would love to see more details if you don’t mind sharing? Wedding bands, close up shots of both your dresses, and more. I’m such a sucker for details! As a new mom myself of a 12-week old, this post had me with tears rolling down my face. It helped me relive my wedding in April :-). Best wishes and lots of love! I enjoyed all the pictures of your special day! I love your choice location. Beautiful scenery. It looks like you had a wonderful time celebrating. I wish you both many happy years together with lots of love and happiness! Such a fun, wonderful, joyous blog, Ali! I am soooo thrilled that your wedding was perfect for you! The setting, flowers, set-up with ALL of the wonderful details made for a magical wedding! I am so glad Molly didn’t get sick until a few days AFTER your wedding weekend! How old is your sister and brother-in-law’s baby? I’m thinking she’s close to Molly’s age? You looked stunning and gorgeous in both of your dresses! I giggled that you forgot your veil and the bow for your reception dress! Absolutely Beautiful Ali !! So simple and perfect, just love your taste in dresses, flowers, table setting, just everything !! What a BEAUTIFUL bride you were!! And Kevin cleans up nice too 😉 congratulations and all the best for you and your family! 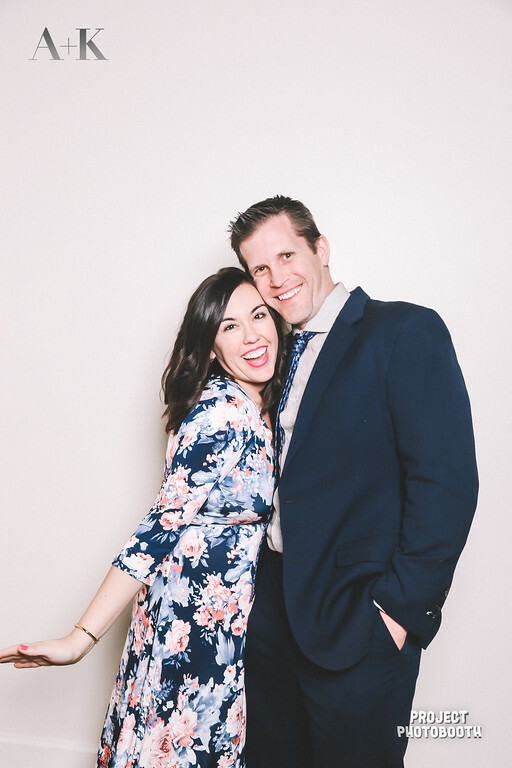 It truly is a blessing to find such an incredible partner to share life with! From one new wife to another, cheers!! Congratulations! I just got married this past weekend so looking at your photos of your wedding makes me hope my photographer hurries up so I can see some of mine soon too hahahaha. Best wishes to you and your hubby for a lifetime full of happiness. Been a fan since your Bachelor days! Love ❤️ seeing you married!!! Thanks for sharing bits of your life experiences with us, it’s so much fun to celebrate with you! In spirit anyways lol?❤???? Congrats Ali and Kevin !! Wishing y’all nothing but love and happiness . Ali I have been a fan of yours since you were on the bachelor. I’m so happy that you found your man after all . I love your little family . Molly is so cute and adorable . Sending love and light always to y’all . ALI- STOOOOOOP! Stunning doesn’t even begin to cover it. You can clearly tell it was a spectacular day filled with an abundance of love. Also- totally misty eyed over here. I am so happy for you! Ugh this post gives me all the feels!! Congratulations to you and Kevin (and Molly)! You two are absolutely perfect for each other! All the best in your future together. Thanks for sharing! Congrats!!! To both of you Ali and your husband (Lol, your favorite new thing) Kevin! Awesome pics and blog! May you guys have a happy and joyous life together with your kiddos!! Hope to keep reading and enjoying your family growth!! Gbu!!!!??? This is so cute- I also just read your US Weekly article on the plane. I bustled my dress wrong at my wedding, and didn’t notice until I saw pics (Vera Wang- the bustle was everything, I was bummed). It reminded me of you forgetting to wear your veil. I hope you are not saddened by that missing piece. You were graceful in your comments about it, and your wedding was gorgeous! A year later I’ve gotten over my bustle and you will for sure realize how minescule your veil was in the scheme of things. Something like that happens to even the most organized brides and many worse things could’ve gone wrong. 🙂 Congrats on your wedding!! 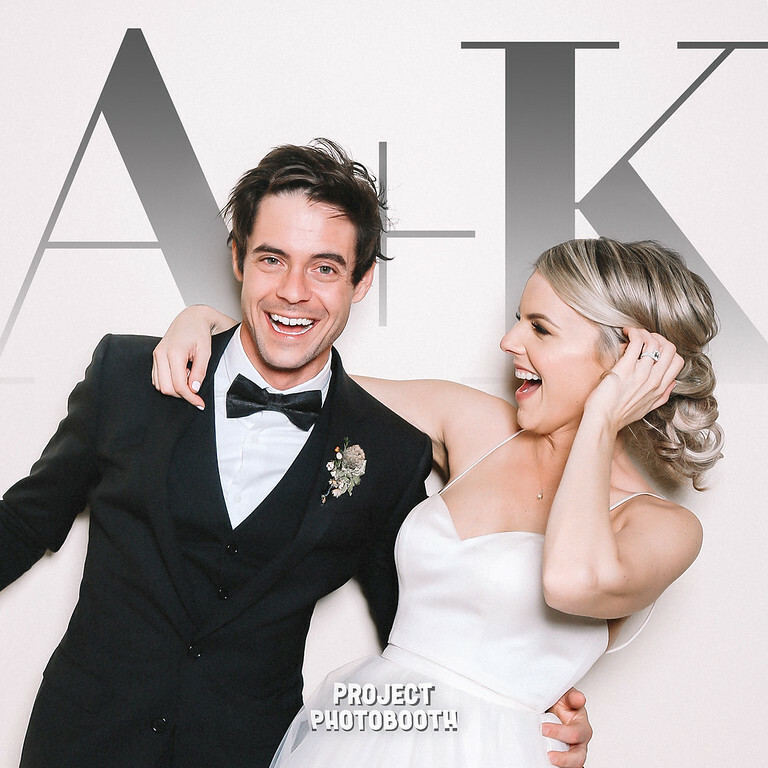 Ali, huge congratulations to you + Kevin. Looks like you had an amazing day. I’ve followed your journey in the UK since Jake’s season and to see you marry Kevin and have baby Molly is wonderful. Wishing you all the happiness in the world. First of all THANK YOU for sharing this special day with us and 2nd CONGRATULATIONS to being finally married to the man of your dreams! What a journey it was! 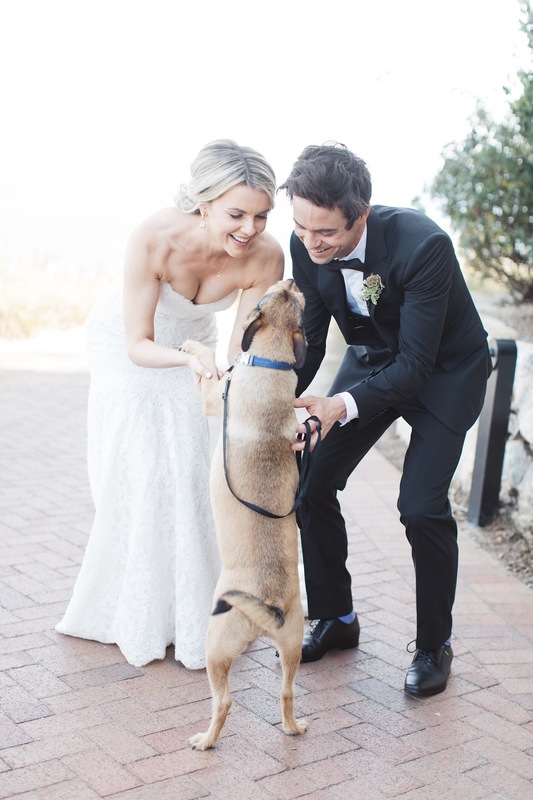 The wedding looks just amazing, setting stunning and i LOVE that you included Owen ( i have a dog too, so i know how it is to have a furry child) and Molly is just a really cute pie <3 <3. Absolutely stunning! I knew you both would be! Thrilled you got your sunny day! Sorry to hear Mexico and Zika is so bad! What do you know? Headed there in 10 days, hoping it’s okay in Cabo.? I haven’t heard any reports lately. Love following you and your beautiful little family!? There is still zika in Cabo. You shouldn’t travel there if you are pregnant or wanting to get pregnant in the next 6 months. Just beautiful!! I remember forbiur wedding we got one of those super fancy espresso carts because my husbands loves his mochas..lol. Anyway, neither of us got anything from the cart…I didn’t even see the cart since it was towards the end of our outdoor tent! Oh well…people said they loved it..lol. Your wedding was absolutely beautiful! You looked stunning!! And don’t worry I forgot my veil on the day of my wedding too 😉 haha happens to the best of us! Wishing you and Kevin a lifetime of happiness!! These are so so beautiful! Thank you for sharing a part of your special day with us!!! You are glowing! (loved the smores table) has not gone un-noticed. Your wedding was like a fairy tale come true. ? Your sister Raya & friend Steph looked stunning. 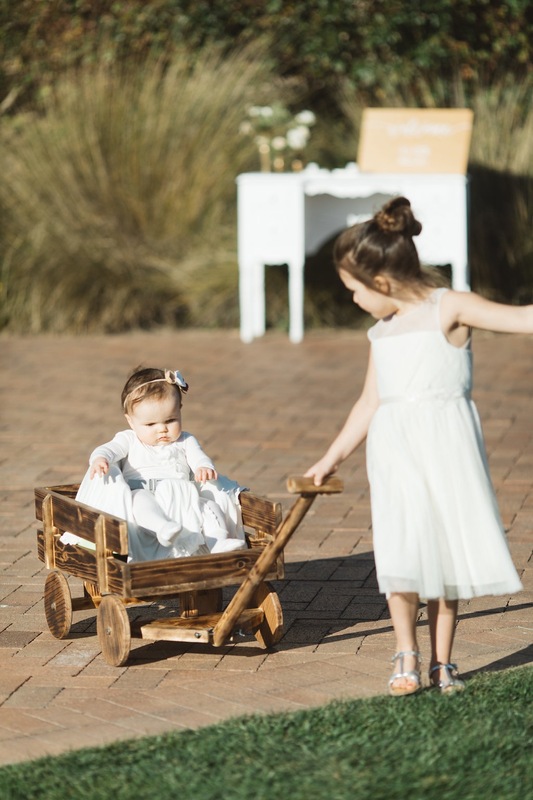 Lennon pulling Miss Molly in the wagon…….cuteness overload! Extra treats for Owen. ? Thank you so much for sharing this with us! Everything looks perfect! I am not sure how you took your first dress off though because it is sooo perfect! I would have slept in it. haha! The second dress was nice too. Beautiful details and Molly is soo darn adorable! Wow so stunning and gorgeous! Molly in the wagon was too much cuteness! Congrats! Wishing you and your family all the best! You made a beautiful bride and stunning pictures ! Post a picture of your beautiful engagement ring and wedding band ! Beautiful! What brand/color lip gloss were you wearing? I love that! Ali, You are one of the only real young women who appear on the bachelor series and I am so excited to see you have found love. 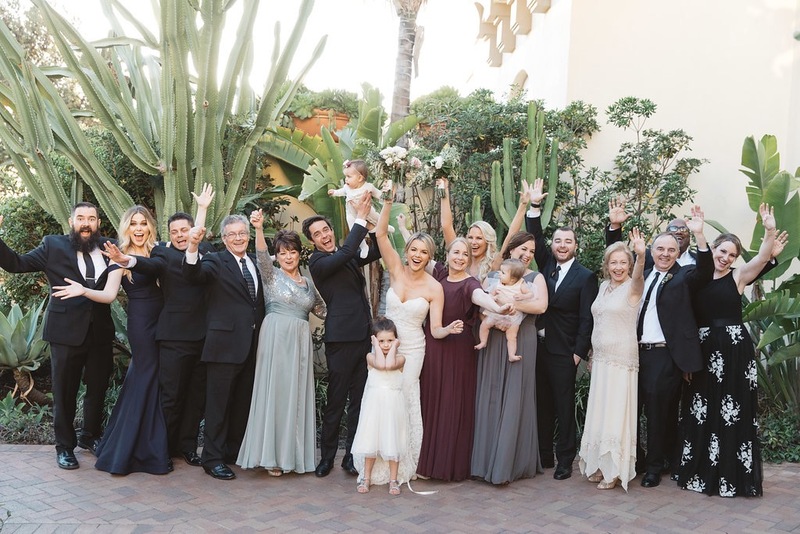 It is exciting to see you and Kevin in these romantic and loving pictures with family and friends. Wishing you all the best for a wonderful future together. Wow! Just Wow. The pictures are amazing. Thank you for writing this blog about it. I could certainly feel the love from that day as I read this and all I could picture was you sitting there writing this with a huge smile on your face! Can’t wait to see the video and the photo booth blogs!! So happy for you all. Congratulations Mrs Manno!! Ali, the wedding was stunning! I love all the pictures! Your little family is perfection! Congratulations on your beautiful day! Congrats Ali! Such a beautiful day, so happy for your family. Love the photograph of the Manno and Fedotowski family together! Loved that you included Molly in the ceremony! Also loved that Owen was there as well. You all look very happy! Looks like Kevin makes you laugh! Ha! Wishing you two a lifetime of happiness! So adorable! And happy for you! Congratulations! Which of these vendors provided comped services? You are required to disclose sponsorships in a transparent way, as I’m sure you know as an online influencer. Gorgeous wedding and beautiful family. Congratulations! Absolutely beautiful, stunning and heartfelt post! I loved every second of the read and the pictures. Ali, you look gorgeous, hubby looks handsome, and of course, little Molly looks her usual adorable self! Congrats to all! Absolutely gorgeous pictures on your very special day. Wishing all of you many, many years of happiness. The pics are amazing, but my favorite is the looks on your faces looking at your son– Owen. Absolutely gorgeous!!! It makes your day even more special since Molly was apart of it!! Enjoy spending the rest of your lives making each other happy!! ps…I’m obsessed with your husbands hair!!! Ali it has been an absolute pleasure to watch your life journey. I knew you were an admirable young woman when I watched you on the bachelor /bachelorette. Thank you for sharing your special day with us. Wishing you and your beautiful family many years of good health and happiness. Seriously the cutest couple every! Your wedding looks like a fairytale. I’m so happy you found your happy ending. Looking forward to watching your family grow! Cheers to many years of happiness ? Ali you look truly happy and beautiful from the inside out. You are my favorite Bachelorette and you got me hooked on watching them all after your season. I was heartbroken for you but we now know that someone better would truly have your heart and you his. Congratulations and many blessings to your family! Congrats! You look stunning and Kevin looks very handsome. But I gotta say… I ❤ the picture of you and Molly! Wow! Such a beautiful day and a wonderfully written post to share it! You’ll be able to reread this forever to help you remember the joy! Congratulations sweet family! I just have to say that I have followed you since the Bachelorette days and I teared up reading this. I am so insanely happy that you found your happily ever after. The last photo of your husband looking at you just shows how crazy in love he is with you. You have always been my favorite ♡ Congratulations! You look stunning!!! Congrats to you and your family! Congratulations! Thank you for sharing your special day with all of us. Everything was perfect! You looked so beautiful and so happy! Best wishes to you, Kevin, Molly, and Owen. ❤? 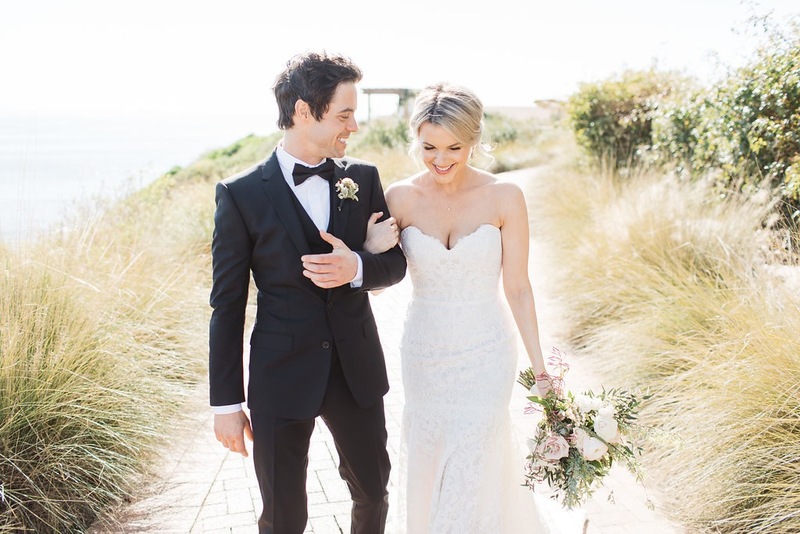 Ali, Thank you for sharing your beautiful wedding day with us! You look absolutely stunning!! I wish you and Kevin a life filled with much love and happiness always and forever!! Ali, what a beautiful way to sum up one of the best days of your life! You look absolutely beautiful and I wish you and Kevin a lifetime of happiness, love, and good health! 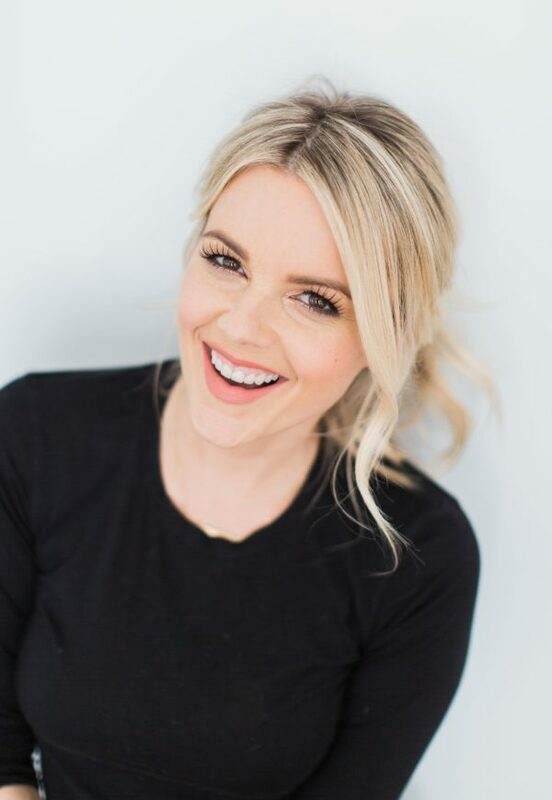 I have been following your story ever since Bachelor/Bachelorette days! It is nice to see you found true love and happiness. Beautiful wedding Ali! My husband and I were staying at the resort when you got married. I didn’t know at the time but we saw your daughter in the wagon. We were going to wait to see the bride but I felt awkward just standing there. Found out after we went down to the restaurant it was you. So mad I didn’t wait to see the bride! Lol Love reading your blog and your outfits. Congratulations so beautiful. I just got married back on October 18,2015. I know how stressfull it can be. Enjoy the honey. Ali, I admired you from day one. I watched your journey unfold. Molly is such a beautiful little doll. Question when is baby # 2 ? I could not wait for you to add this post!! What a beautiful love story. May you be blessed with many years of happiness. I love reading your posts and seeing all your pics. ? What an amazing day , weddings are so beautiful but the after wedding blues was a real thing for me, hope you not having them . How did you guys meet have you mentioned it on your blog before ? I love seeing all of your posts and cannot wait for more to come.. I am in awe of everything you have achieved over the past 8 or so years since I watched your season of the Bachelorette. You have grown and learnt so much about yourself which makes you who you are today. Kevin is a very lucky man!! I am so happy for you all – your happiness is truly tangible throughout your posts. Your wedding – well a true testament of the people you are. Homely, elegant, warm and genuine – not over the top, ostentatious and in your face. You are going places Manno family – keep spreading the love. Its lovely and refreshing to see. Congrats Ali! What a beautiful wedding and you were a stunning bride! My hubs and I (Massachusetts natives) have watched the Bach for a few years now and you have always been our fave. So thrilled you’ve found your match and that you have a precious baby girl! We had a boy 1.5 years ago– isn’t it the best?! Exhausting but the best! Congrats! ?? First of all congratulations on your wedding, you look absolutely stunning and it shows because you look so happy. I’m so happy for you that you found the love of your life, and Molly looks beautiful. Congratulations I hope you have a happy life together forever. I’m a hopeless romantic and just love everything about your wedding, you looked absolutely stunning and both you and your hubby had beaming smiles! So Happy you got your fairytale “happy ever after”! I don’t ever write on celebrity Instagrams or blogs-because well, we don’t know each other! But, I’m so inclined to leave you a comment to say a. Congratulations on a beautiful wedding and what seems to be a beautiful relationship –> marriage with Kevin. b. Your daughter Molly is beyond cute. My brother and sister-in-law gave birth to my niece Stella 9 months ago (Santa Monica residents), she’s about a month older than Molly. And, from time-to-time, I take screenshots of your cutie outfits on Molly from Insta and send them to my sister-in-law. Babies!!! Anyway, great blog post! Beautiful wedding! Congratulations! Your love is shining through. Perfection! Beautiful wedding. Everything is perfect. Love all the pictures. Baby looked so cute in wagon. The last picture is my fav. Best of luck on your future together forever. Adorable! Just an adorable family, love the photos! Thanks for sharing with us!! I loved all of your wedding photos. Thank you and Kevin for sharing them with us. You make the perfect family. I loved the way Molly came in the wagon. Can’t wait to see the video. I have followed you, Ali since you were the bachelorette and Kevin from the Dance Mom Competition. I was so happy when I saw you two were a couple. Perfect match. Best wishes for a wonderful life together. ?????? Your wedding was so beautiful. Congratulations to all four of you( Owen included) I’m happy to see you so happy. Wow! Beautiful photos and amazing day for both of you and Molly! Didn’t want to get married in New England? Just kidding! It would be freezinggggg cold. Your location was beautiful your dress(es) were beautiful and I’m sure your wedding was spectacular. Wishing you, Kevin and Molly all the best in this new and exciting chapter in your lives! Congratulations Ali! I’m so so happy for you! You deserve all this happiness. HI Ali! You look beautiful! Do you know what lipstick you were wearing? I love it! Gorgeous wedding! I got chills reading about it! Congratulations on all your happiness! Stunning couple, and adorable baby girl! Congratulations to the three of you. I love your blog, and your genuine enthusiasm for life, which is very evident in your postings. To a lifetime of joy and happiness! Cheers!!! Ali, What amazing pictures. Everything looked so beautiful. Looks like you did n amazing job on your wedding details. And you looked amazingly happy. I wish you Kevin and your sweet angelk Molly the best of Love Life and Laughter always. So very happy that you found love. Not just love but the love of your life. God Bless you and your’s. I look forward to following your journey of happiness. Gorgeous!!! But you forgot to show us your wedding ring! So sweet and many congratulations! Love, love seeing you and your girls in your Plum Pretty Sugar Robes! You all look so so pretty! I live in the Netherlands and I’m reading you blog every time and I love how you share this wonderful day with us, thank you for that. You and Kevin look stunning on your weddingday. I wish you all the happiness in world with your loveones. Gorgeous!! Congratulations!!!! Terranea is a beautiful place – I have been before, and now that I live in LA, need to go back ASAP!! 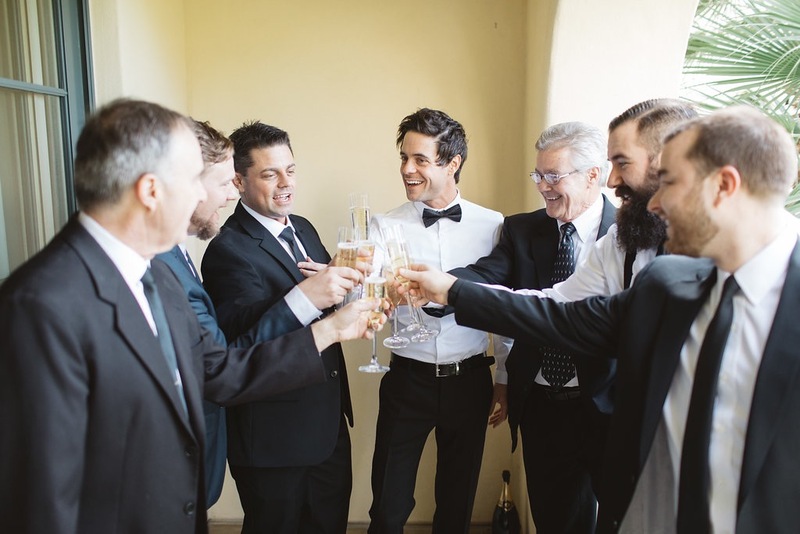 I loved reading about your wedding day – I can feel all the emotions! Wishing you and Kevin a very happy life together. P.S. Molly is adorable!! Congratulations! I’ve thoroughly enjoyed following your journey since the Bachelorette. You’re such an honest breath of fresh air. The love you have for your family is so palpable and refreshing. Thanks for letting us follow along! All the best. 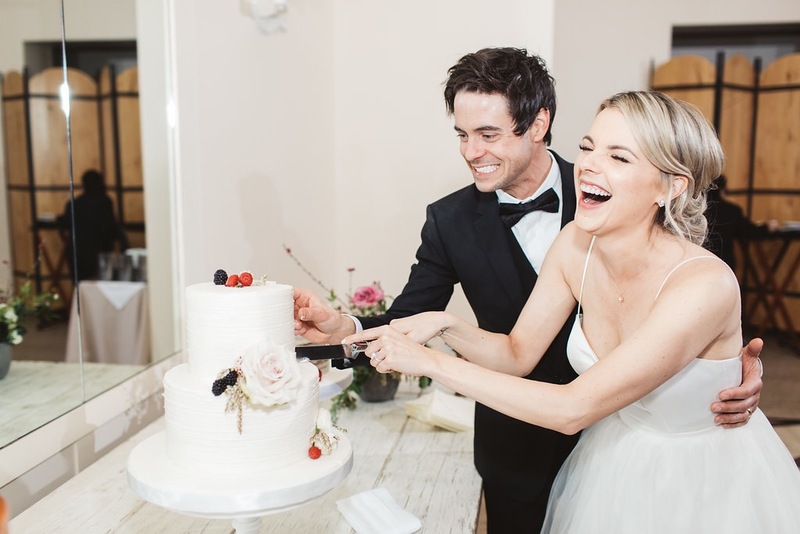 Beautiful recap of your wedding, Ali (my name too)! I am loving all the details you put into describing your day. I am actually getting married in November and noted ideas for my wedding!! <3 Congratulation to you both!! WOW! I am at a loss for words, everything looks so PERFECT and the whole entire wedding crew is sure grateful to have you as a bride. Leading up to the BIG DAY, you seemed totally calm. But I don’t know you personally but follow your blog for great ideas from fashion/food and fun stuff. You handled it with CLASS -unlike some of my friends LOL! 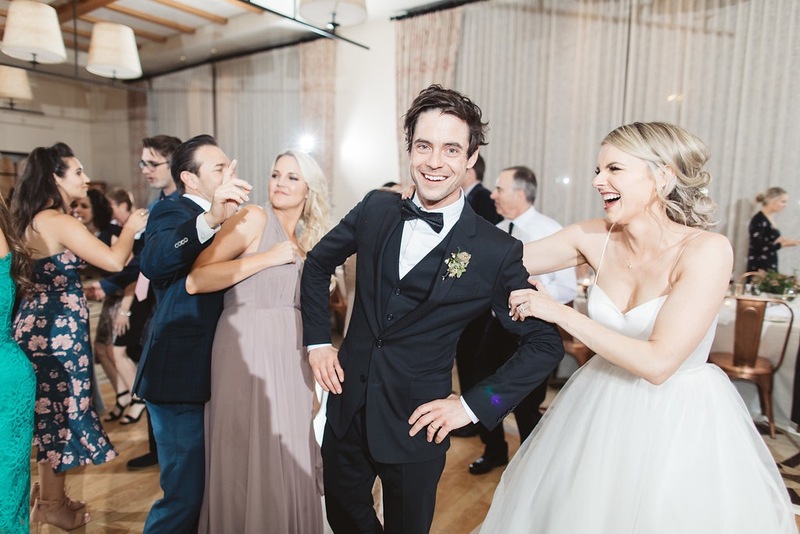 It’s the Bride and Groom who make the party, who set the tone, create the mood, and etch the memories. That said, congratulations on orchestrating yet another great Post & Wedding. I have not been married but helped plan and it’s a lot of work to make someone else’s day perfect. , I can’t wait for mine… hopefully soon! Been with my guy for almost 4 years ….Fingers Crossed!!! Congratulations on your big day! Everything was beautiful! The most beautiful of all is the love than shines through your pictures! So happy for you, Kevin, Molly and Owen. What a beautiful family! Ali, I absolutely love keeping up with you. You were hands down the BEST bachelorette ever. I saw you in LA once at KOI restaurant and you were even more stunning in person. What an absolutely beautiful family you have. You couldn’t have looked more amazing at your wedding, just gorgeous. That Molly, I could just eat her up, she is beyond precious. I wish you, Kevin and Molly many wonderful years together. That last picture is AMAZING! Like seriously stunning. It’s just great. I hope you don’t mind, I took a screen shot of it, and I’m going to tell my photographer that I want one just like it when I get married, G-d willing. be 8 months at the time and was wondering if you’re still breastfeeding? I’m wondering because if so, I want to know how you did it on the day of! I can figure out feeding him while I get ready and/or pump but know I’m not sure how it will work during the reception. Plus, I’ll be wanting to drink ? He usually goes down for the night around 7ish and I put him down every night but I guess I’ll have to figure out a babysitter now that can do some practice bedtimes with us so I know he’s in good hands that night. My company Black Tie Kids was the one who cared for Molly and all of the other littles at the wedding. We provide crafts, games, and activities on site in a separate area so the kids can have fun and the adults can adult! If you are interested, we would love to send you a quote. First off CONGRATS to the newlyweds!! Welcome to the marriage club ???? I always knew you were going to be a beautiful bride but WOW you looked absolutet stunning!!! Now as far as your blog…..I LOVED every single word you wrote!! I have been looking forward to hearing/seeing/reading all about your special day???? And it brought up so many memories of my own wedding ( 2 years ago this May)!! 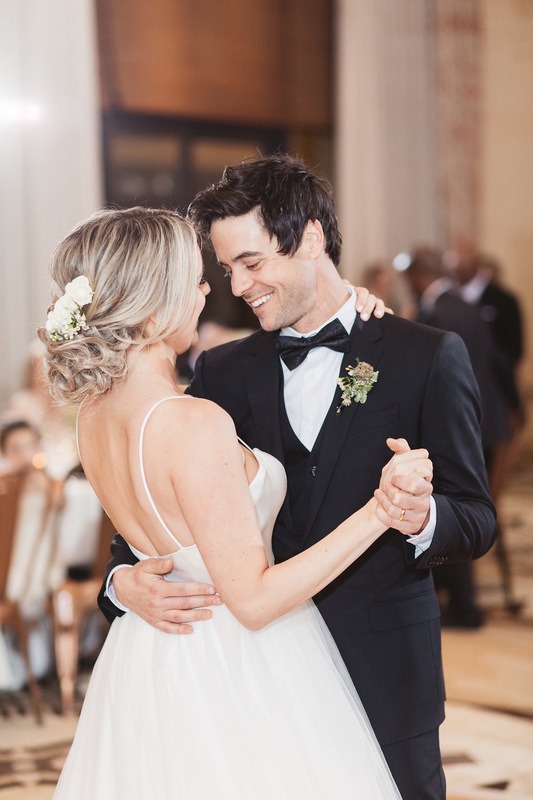 At one point, during our reception, my husband and I stepped back and just looked around at all of the most important people in our lives in one room dancing their hearts out and celebrating us. Most incredible feeling ever– it still gives me gooseys 2 years later thinking about how incredible it all was!!! And that is really what it should feel like!!!! There is soooooooooooooooo much that goes into planning a wedding but in the end all the “blood/sweat/tears” the ups and the downs the stress ..is so worth it when it all comes together. You give hope to so many women out there not to give up on love and finding happiness. Molly is such a lucky little girl to have such a beautiful mother both inside and out. Thank you for sharing this gorgeous day with all of us! Congrats to you and your new Hubby I wish you both all the happiness in the world?❤️? PS –totally unrelated but I have always wondered how you became such good friends with Kaley, Amy, Lacey etc !! You all look like you have the best times together and I saw they were all in attendance at your wedding.! Molly is the sweetest & it’s truly amazing how things work out for the better! Thanks for being an inspiration to me, always! You’re such a bundle of joy!! Congrats Ali to you and Kevin on your marriage. 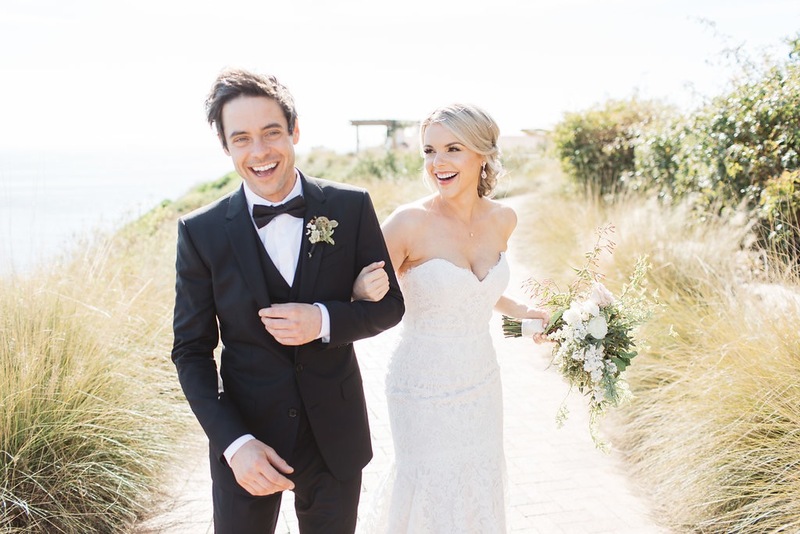 Welcome to the club of being married.You looked so beautiful in your wedding dress.Your wedding was so beautiful. Glad that you found the man of your dreams. I am SO happy for you. May your marriage with Kevin bring you lots of joy and happiness. Your little Molly was so cute in her little dress. Thanks for sharing some of you’re wedding pic with us. Hi Mrs. Manno! Beautiful blog! I laughed, I cried…I wish you and Kevin all the best! Stunning photos! And little Miss Molly…be still my ❤. Congratulations! ???? What a beautiful day!!!!!! I love your dresses and Kevin’s bow tie! I’m going to steal a few ideas for my own wedding this summer!! This is so beautiful, I could not stop crying. Congratulations Ali, I think you are an amazing human being and will make an incredible wife. ??? Wow! You looked stunning. Beautiful venue for a beautiful couple. I was there for brunch on 3/5! How did I miss it? I would’ve totally geeked out. Beautiful wedding! Beautiful you! Beautiful family! I wish you three a beautiful life! Cherish each other. Congratulations! Ali, your wedding looked radiant beyond words! I’ve followed you for years and just love your taste! You’re a beautiful soul! Congrats to you and Kevin! I am just seeing your post now! I am a little late, but I did check out US Weekly! 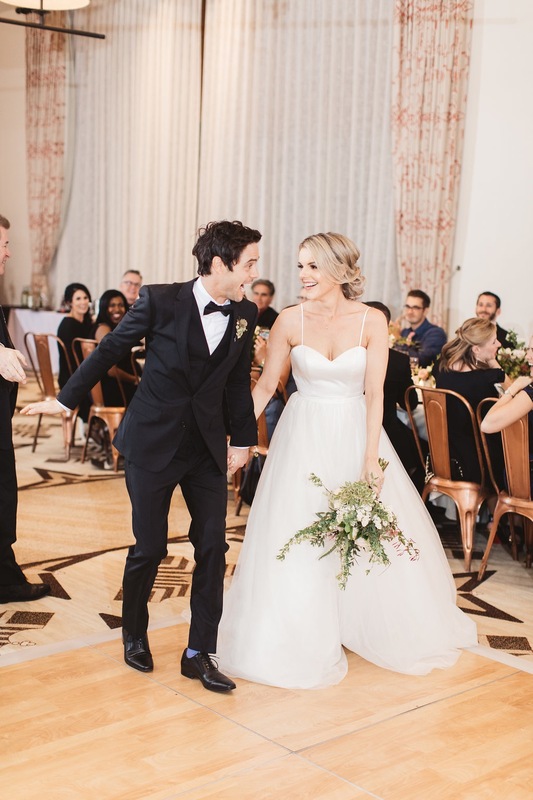 Ali, your wedding looked absolutely stunning! All the details are just beautiful! And Molly looked so adorable!! Wishing you 3 the very best! I forgot to mention your first fur baby, I think it is so sweet that Owen was included! Yay! Congratulations! Thank you for sharing such an important day with us. It is an honor. Wishing your family such happiness. Gorgeous, gorgeous, gorgeous, I could look at a million more! You are so cute and genuine, I love your blog, the realness of it is a breath of fresh air! The photo with Owen might be my favorite…it’s great he could be a part of it. 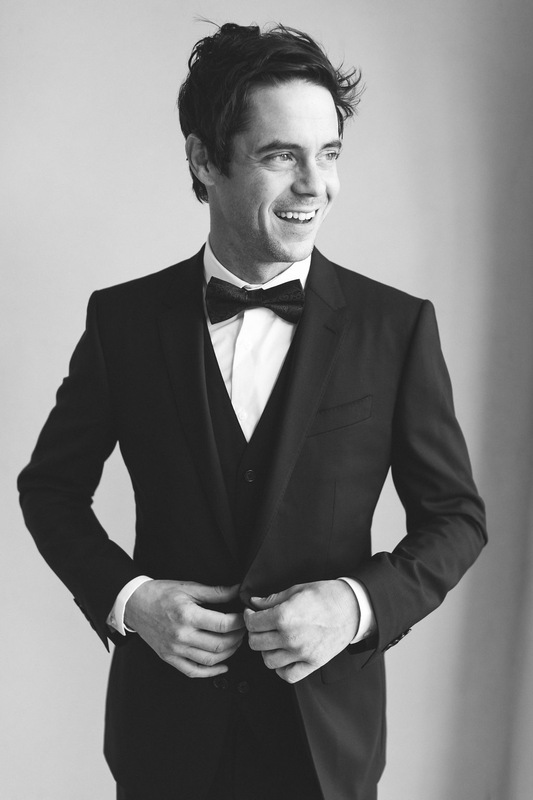 Where is Kevin’s tux from? I absolutely love everything about your wedding, it seems like it was picture perfect. 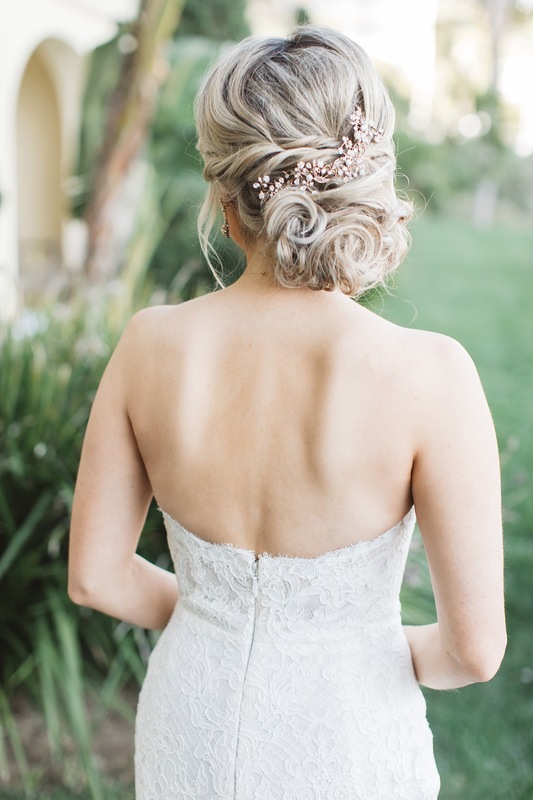 My daughter is a flower girl in my brother’s wedding and we just ordered a headband from theCshoppe on Etsy – I am so in love with them!! Thank you so much for sharing! Everything was absolutely beautiful (I just bought the same drink stirrers for my upcoming wedding in October). What did you do for wedding favors? I am having the hardest time coming up with something! Where did you get cake stands!? Getting married in June and love yours!